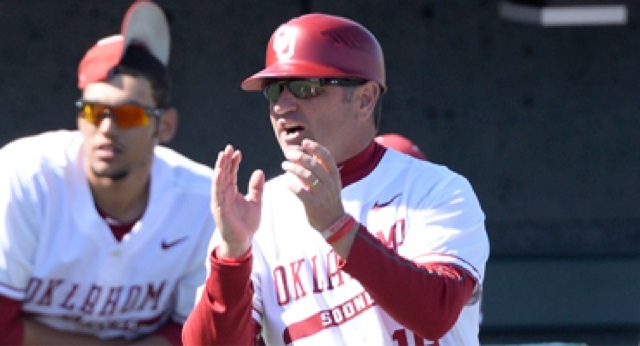 University of Oklahoma head baseball coach Pete Hughes released his team’s 2017 schedule on Monday afternoon. For the first time in five years, the Sooners will open on the road; beginning with opening day at Long Beach State on Friday, February 17 to begin a three-game series. Oklahoma gets the first home game of the slate under its belt on Tuesday, February 21 against Grambling State at L. Dale Mitchell Park. An evenly balanced schedule features 27 home games, 26 road games, including two trips to the Eastern Time zone and one to the Pacific, and the Bedlam series in Tulsa and Oklahoma City. The Sooners play nearly half of its schedule, 24 games, against 10 teams that finished 2016 in the top-75 of the RPI ratings. A total of 18 games come against seven opponents that appeared in a NCAA Regional; eight of which will be played at home. Oklahoma opens its season on the road for the first time since 2012. Just like a three-game series against Pepperdine four years ago, the Sooners head to southern California for a three-game set against Long Beach State, February 17-19. The Dirtbags hold a 4-2 advantage in the all-time series after the two sides met for a series in Norman last season. LBSU picked up wins of 7-3 and 6-3 in a doubleheader to open the series, but Oklahoma bounced back in a big was to salvage the finale. Hunter Haley blasted a three-run, walk-off home run to right-center to provide the dramatic finish to a ninth-inning comeback. The Sooners trailed 3-2 entering the ninth and got the rally started with a Alex Wise single. A Steele Walker single put runners on the corners and Ben Hollas was called upon for a pinch-hit appearance. He put down a bunt to the first base side of the mound to score Wise on a suicide-squeeze to tie the game and set up Haley's game winner. Coach Hughes introduced the Sooner Baseball Classis in 2015 with Notre Dame and SIU-Edwardsville coming out to Norman. This season, Oklahoma welcomes Villanova, Northern Illinois and Boston College for the weekend of February 24-26. The Sooners open with the Wildcats, who they will face twice in their four games that weekend. The final contest of the classic for OU pits the Sooners against Boston College, where Hughes spent eight years as the head coach from 1999-2006. The Eagles are coming off a banner season that saw them reach the NCAA Super Regionals with a 35-22 record under head coach Mike Gambino. The 35-win season tied the school's high set by Hughes' 2005 BC squad. Gambino was an assistant coach for Hughes at Boston College from 2003-05 and later at Virginia Tech from 2007-10. Northern Illinois head coach Mike Kunigonis also spent time on a Hughes staff. Beginning as a volunteer and later an assistant under Hughes, the two coached together in Blacksburg from 2008-13. Exactly like two seasons ago, Oklahoma begins the home portion of its conference slate against Texas Tech at L. Dale Mitchell Park, March 31-April 2. In 2015, the Sooners returned hoem from a series at Hawai'i to face the Red Raiders and came away with a series victory to open Big 12 play. Oklahoma overcame a 6-1 setback in the opener by rattling off wins of 5-2 and 3-2 to finish the series. Alec Hansen dominated game two to even the series with a complete-game, three-hit, 10-strikeouts performance. Robert Tasin came out of the pen in the first inning to save the day for OU and went 5.1-scoreless innings to earn the win; assisted by a four-hit day from Taylor Alspaugh. Last season, the Sooners won their first home conference series of the season by taking two out of three against Texas. Jack Flansburg drove in three runs in a 6-1 Friday win. Oklahoma then came from behind on Sunday to win in walk-off fashion on a RBI-single from Hollas. The Sooners are 6-3 in Big 12 home opening series under Hughes. Oklahoma claimed its first Bedlam Series win since 2010 by taking two out of three in 2016. Jake Irvin dominated the opener at Chickasaw Bricktown Ballpark in OKC in a rain delay-shortened start. Cody Thomas drove in five with a three-run jack and two-run double in the 9-1 OU win. The Sooners would get the tying run on base in a 10-9 loss on Saturday before finally taking the series behind a strong start from Dylan Grove to down the No. 12 Cowboys, 3-1. Series victories over Texas and Oklahoma State marked the first time Oklahoma claimed both in the same season since 1998. The Sooners will play the role of host this season with game one at Tulsa's ONEOK Field to begin their final weekend of the regular season on Thursday, May 18. The series then shift's to Bricktown Ballpark on May 19-20. The two sides will also meet for a non-conference match-up in Stillwater on Tuesday, March 21.